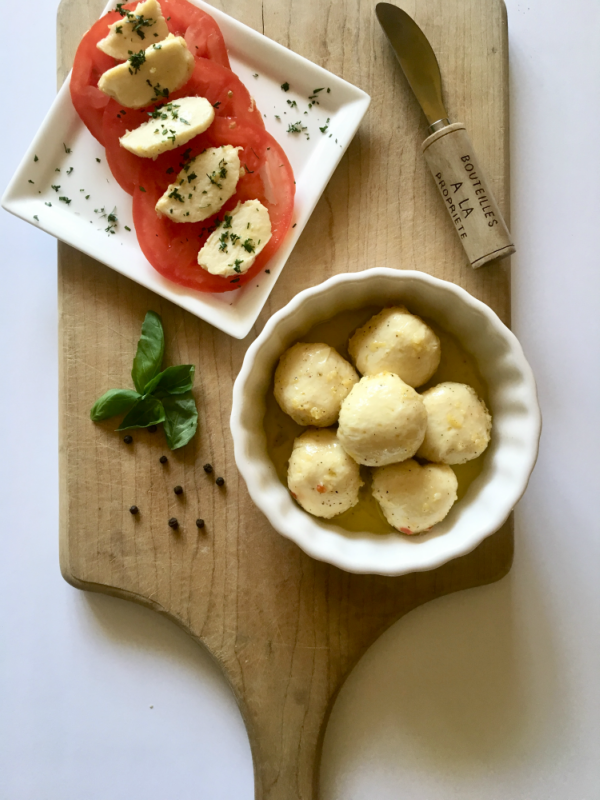 These marinated vegan bocconcini (aka – mozzarella balls) are next level awesome. So awesome that I can hardly believe they’re real, that they actually exist. They’re firm but not too firm, slice-able, melt-able, and have a perfect, zesty lemon pepper flavor punch to knock your socks off and leave you wanting nothing but more. I know this because we have made at least 7 batches of this recipe in the past two weeks. It’s true, and I don’t care who knows it. 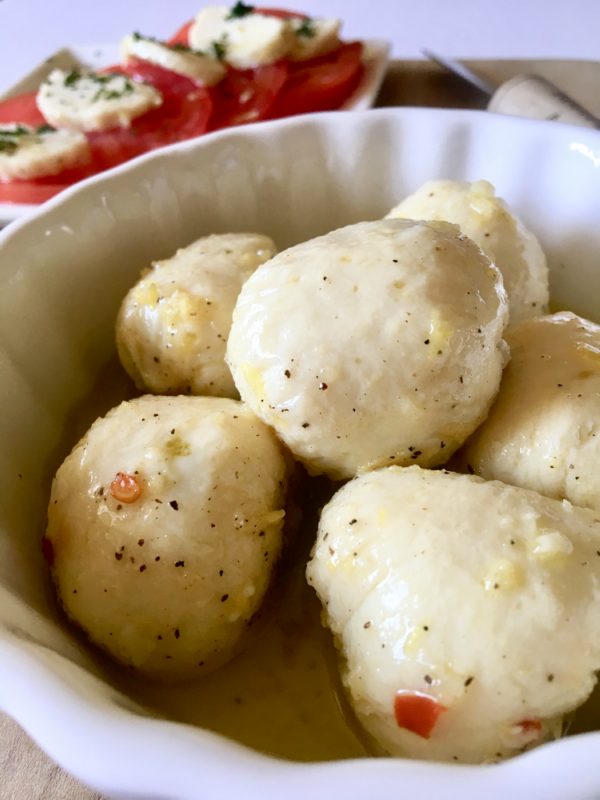 I’m in love with these lemon pepper marinated vegan bocconcini! But guess what; I’m not the only one! T and I took a huge batch of these marinated vegan bocconcini to the shore with my fam last weekend, and everyone went nuts over them! It was really exciting to see, especially because the only vegans in the room were T and myself. I could not have been happier! We served them with crackers, our vegan feta, and of course plenty of wine. Needless to say, it was a pretty perfect day at the beach! 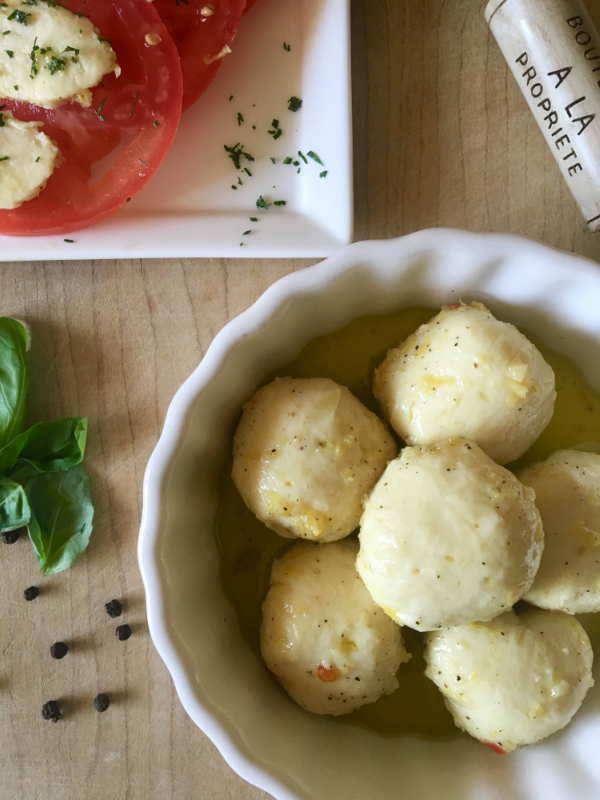 If you’ve never made your own vegan mozzarella before, don’t worry! It may take some getting used to, but it is so fun and exciting to do. The methods we’re using here today were inspired by some of our favorite vegan cheese-making icons: Connie from Connie’s RAWsome Kitchen on YouTube and Skye Michael Conroy, aka, the Gentle Chef and author of The Non-Dairy Evolution, a book we highly recommend for cheese-loving vegans (or not-yet-vegans) everywhere! tapioca starch – Commonly found with the Bob’s Red Mill products at grocery and health food stores, this starch acts as a thickening agent when the cheese mixture is heated and creates that ooey, gooey, cheesy texture. kappa carrageenan – This stuff is like plant-based gelatin, made from a type of red seaweed. It may sound weird, but it’s a pretty common ingredient in non-dairy products and dairy products alike. It comes powdered and is used in this recipe as a thickener / stabilizer / all-around secret weapon. You might be able to find this at your local health food store, but we suggest ordering it from Amazon, so you know you’re getting the right one. Here’s the brand we use! Once you’ve blended your cheese mixture, you’ll pour it into a pot and heat it, while stirring, for about three minutes or until it’s all goopey and stretchy and cheese-like (more details on this in the recipe below). From there, you’ll wrap the mixture up in little balls of plastic wrap, let ’em set in some ice water, then marinate them in this heavenly pool of zesty marinade. Then, you try them and share them, and your world, and heart, are forever changed. But, that’s how it happened for me, and I hope it’s how it happens for you too. I hope you fall just as much in love with these marinated vegan bocconcicni as we have! 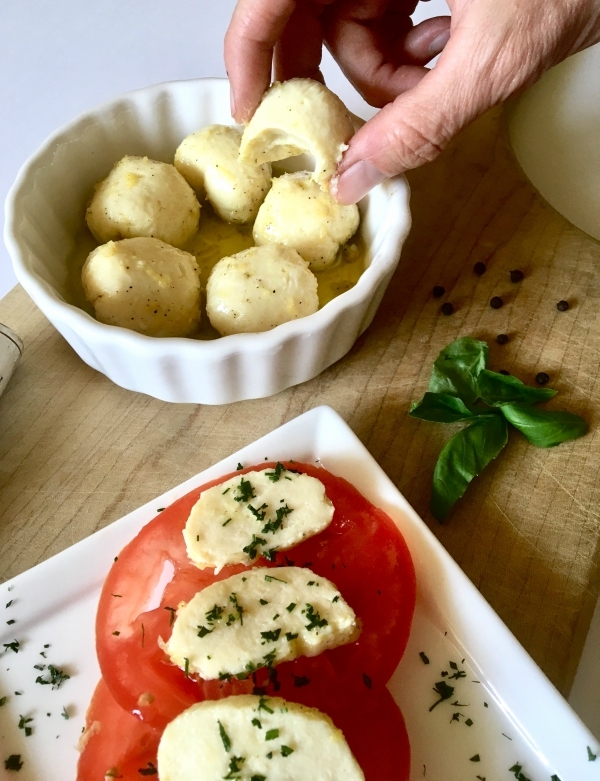 If you give this marinated vegan bocconcini recipe a try, we’d love to hear about it! 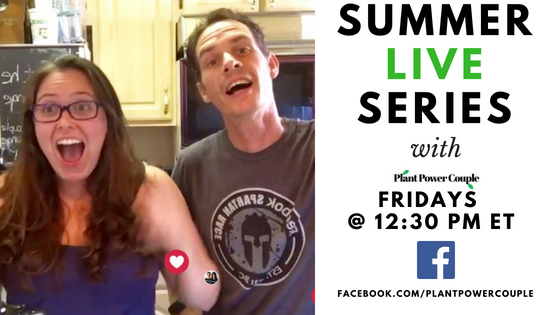 Leave a comment and rate it below or tag us in all your screen-licking-inducing photos on Instagram (we’re @theplantpowercouple, with the ‘the’). 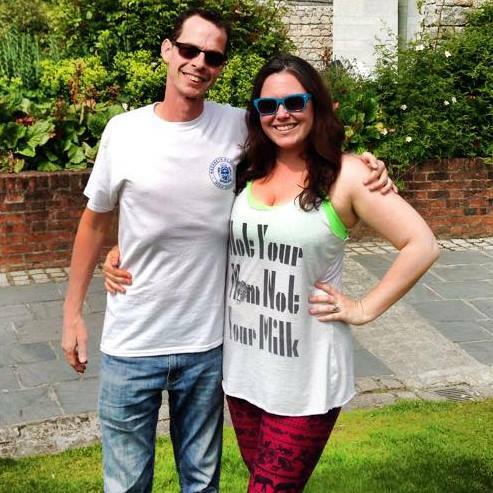 Now, go forth, make some kickass vegan cheese, and ENJOY! First, make your cheese mixture. Throw all the ingredients for the cheese in a blender or food processor and blend on high for about a minute. Next, pour this mixture into a medium sauce pan and turn your heat to medium high. Using a wooden spoon, stir the mixture continuously, using the spoon to pull the mixture away from the sides and bottom of the pot with each stir. After about 3 minutes of stirring, the mixture should thicken into one big gooey glob that easily pulls away from the sides of the pot. This means it's ready! Set up your ice bath station: Fill a large bowl or container with ice water and set out some plastic wrap and scissors. To roll each mozzarella ball: cut a 6-inch piece of plastic wrap and lay it flat on the counter. Spoon 1.5 Tbsp of the cheese mixture into the center of the plastic. Then, pick up the bottom corners and fold upwards over the cheese mixture to meet the top corners. Pull the ends together and flip the cheese away from you about 3 times. Then, tie the ends you're holding together gently and place the ball in the ice water. Basically, you want to wrap the mixture into the shape of a ball, so it sets that way. If you get a big air bubble in your plastic wrap, simply poke a small hole in the wrap with your scissors and continue. Repeat until you have used all the mixture, about 10 - 12 mozzarella balls. Let the ice water with all the little mozzarella balls in it sit in the fridge for at least 30 minutes. While you wait, go ahead and make the marinade by throwing all the ingredients in a shallow container (we use old takeout containers for this, works great) and whisking them with a fork. When the 30 minutes are up, take your mozzarella balls out of the fridge and carefully unwrap them. Add each ball to the marinade. Cover the container and shake it around a bit to ensure the mozzarella balls are all evenly coated. We like to flip it upside down a few times too. Let them marinate for 24 hours for the best flavor results! 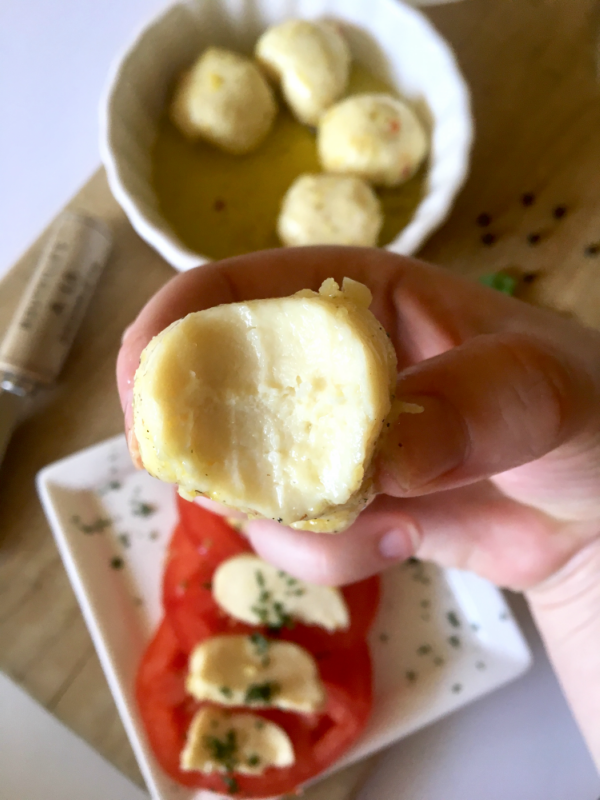 Serve these marinated mozzarella balls on their own as a snack or appetizer, on a salad, with crackers and grapes, or simply pop 'em into your mouth! They also melt beautifully for a seriously kickass pizza or caprese grilled cheese! 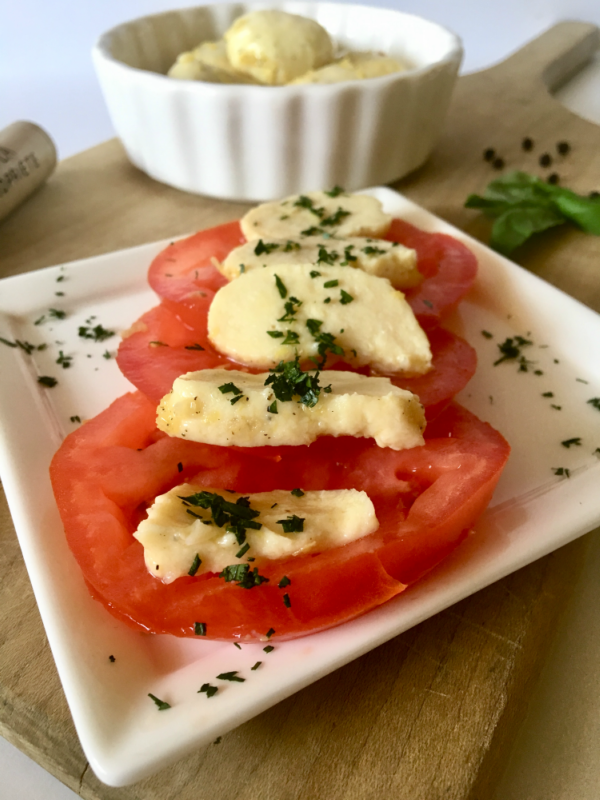 Oh, and PS – If you’re looking for a fun and creative way to use these vegan bocconcini, give our Vegan Caprese Grilled Cheese recipe a try! Eating my FIRST batch with crostini, olives, and marinated sweet red peppers... Outstanding! 5 stars! Sweet Hubs likes it too! Next I'm making your feta... Thanks for this great culinary adventure. We are 5+ years being meat and dairy free...and this is better than the dairy version...hands down! Is there anything I can use instead of 2 tsp kappa carageenan? Hi, Emily! You can sub agar powder, but you may need to add a bit more liquid and let it thicken a little longer.